This report outlines a plan and action program for downtown Payette, Idaho. The plan has resulted from a comprehensive study of the area undertaken by the City of Payette to establish a blueprint for the revitalization of the city center. 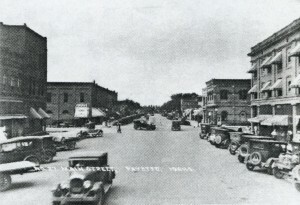 Equally funded by the City of Payette and the Idaho State Historical Society, the Payette City Center Plan was under-taken by the consulting firm of Planmakers. The objective of the downtown plan was to establish an economically sound and attractive center for community life, offering a mixture of shopping, business, entertainment, and recreational opportunities. The plan was developed under the review of the mayor and city council along with public reactions and suggestions. A city center questionnaire, numerous one-on-one discussions, and several major public meetings were utilized to synthesize diverse expressions of community direction. The report begins with a historic perspective and a physical inventory and evaluation followed by an economic analysis. The Payette City Center Plan is then outlined with design concepts and specific details recommended. Finally, tools and strategies for implementation of the plan are identified. The plan serves as a long-range working document for guiding development, preparing policies, determining design details, and setting priorities. Decisions relative to the downtown can be assured a continuity as the plan serves to encourage and guide the area’s development to the mutual benefit of the city, the property owners, and the individuals who will use it. The Payette City Center Plan requires an ongoing evolution of support, city approval, financial resources, and dedication to achieve a lasting and significant impact on the city’s future success.